TECHknitting: Sewing shut hems and facings (part 5 of better cuffs and bands). Sewing shut hems and facings (part 5 of better cuffs and bands). Today's post is about sewing shut a hem or facing: it is part 5 of the series "better cuffs and bands." After the last post in this series (about knitting shut hems and facings) you may wonder why, if it is possible to KNIT shut a hem, a knitter would want to SEW shut a hem. Here are three reasons--reasons I believe are good enough to convince even knitters to hunt out a large-eyed, sharp-pointed sewing needle and get sewing. First, and most obviously, it is not always possible to knit shut a hem. Knitting shut a hem only works for items started on the same edge as the hem (a bottom hem on a bottom-up sweater, a top hem on a top-down sock). Knitting shut a hem on the cast-OFF edge isn't very feasible. A. plain old good looks. Have a look at the top of the man's sock in the photo below. 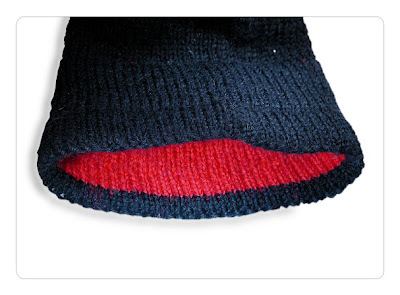 From the outside, this is a practical black sock, suitable for business wear. But on the inside, it features a flaming red hem facing which makes its wearer smile when dressing. B. Another reason why a hem facing might be a different color than the main body of the garment is when you reduce bulk by knitting the hem facing of a thinner yarn. The birthday sweater (click HERE) from the last post had a thinner hem facing than the outside of the hem, and so do the socks, above--the red of the hem facing is a thinner sock yarn than the black of the sock body. It would be unusual to find a perfect color match between a thinner yarn and a thicker one, so this bulk reduction trick is often going to land you with a hem facing of a different color. If you are wondering WHY a hem of a different color cannot be knitted shut, I believe this illustration says it all. This is a close-up of a knitted shut hem. At the black arrow, you will see that knitting shut a hem draws a little "collar" of the hem stitch (hem made in red) to the fabric surface (knitted in green). 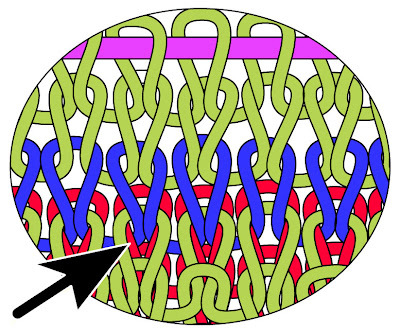 In the illustration, the red of the hem facing shows as a little collar around by each green stitch where the green and red come together in the blue "knit-together row." The knit-together row is illustrated in blue so you could see it easily, but even if the knit-together row were green, like the rest of the garment front, that little red collar of the red hem facing would still show around the base of every stitch in that row--not a nice look. Moral of the story: You cannot successfully knit shut a hem when the hem is knit in a different color than the garment. The third reason you might want to sew shut a hem or facing instead of knitting it shut is the most important, imho. You see, a sewn hem is FAR LESS LIKELY TO FLIP than a knitted-shut one. This is a BIG consideration, as many garments suffer from hem, band, or cuff flip. Cardigans with flipping front bands, and sweaters with flipping bottom bands are one of the banes of the knitter's existence, yet a sewn shut band will not flip with anything approaching the abandon of a knitted shut band. Begin the hem by casting on via the long-tail method. Knit the hem. You may use the same yarn as you will use for the body of the garment, OR you may use a thinner yarn for bulk reduction. If using a thinner yarn, knit the facing loosely on the same number of stitches as you will knit the garment OR on a larger number of stitches with a smaller needle, with the plan to get rid of the extra stitches before you turn the hem. If using the garment yarn for the hem facing, knit the hem as deep as you would like it, then purl one row. For a slight refinement, you may cast on and knit the hem on slightly fewer stitches (5% or so) than the garment, increasing to the necessary number of stitches TWO rows before the purl row. If using thinner yarn for the hem facing, switch to the garment yarn when you are one or two rows shy of the ultimate depth you desire, work a row or two in the garment yarn, then purl one row. If you are using knitting the hem facing on MORE stitches, and a SMALLER needle than the garment, the row to get rid of all the extra stitches is the row where you switch to the garment yarn. The reason to purl one row is to make a nice fold, as seen here. After the purl row, you will be knitting the first row of the garment--that part which is on the FRONT of the hem. You may knit this portion in ribbing, as is traditional, OR you may knit it in stockinette--because you are going to sew the hem facing to the back of the garment, this will prevent rolling, regardless of which stitch pattern you use. On the illustration below, the knitting has been finished. The hem (white) has been folded up over the back face of the garment fabric (purple). As you can see, the "knit" side of the hem shows, while the "purl" side of the garment fabric shows. Thread a sharp pointed needle with a thin yarn (in the picture, green). 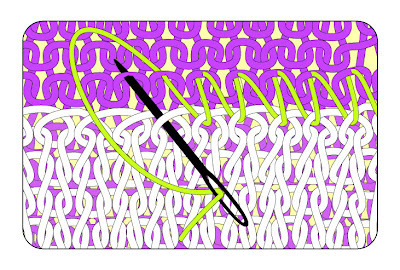 In real life, of course, you would not use a green yarn to sew up a white hem to a purple garment, you would use a sewing yarn as close as possible to the color of the garment face--the sewing thread is green in order that it shows in the illustration. In other words, if I were sewing this hem shut in real life, I would do it with a purple yarn. As far as that goes, I also would probably have made a purple hem to go with my purple garment, rather than a white hem, but in illustrations, a white hem is a lot easier to see than a purple hem facing sewn with purple yarn onto a purple garment. As you can see on this illustration (above) the action of sewing is as follows: with the sewing needle, reach under one arm of the long tail casting-on at the very edge of the hem, then pierce (skim) through the top of a purl "bump" on the target row--the row TO which you are sewing the hem. Draw the needle through, and repeat this action, adjusting the tension of the green yarn as necessary. Be gentle in your adjustment, you want to avoid any puckering on the outside. As you can see, it isn't difficult! The photo on the left side of the illustration below shows the back of a sewn hem "in the wool." The hem is made of the same yarn as the garment face, but sewn shut with dark yarn, so you can see the path of the sewing. The right photo of the illustration below shows the front of this same hem. As you can see, even though this swatch is stockinette, the sewn hem has tamed the dreaded "stockinette roll," as well as the feared "hem flip." You can also see that the sewing does not show on the outside--this is the front of the same swatch on which the hem is sewn shut in dark yarn. One final point: Hems combat "hem flip" best when the hem facing is SLIGHTLY shorter than the outside of the hem AND when the hem is sewn shut very slightly (1 row) ABOVE any ribbing or garter stitch on the outside of the hem. You have been reading TECHknitting on: "sewing shut hems."